This mastermind is designed to allow for a transformational experience among an intimate, safe group. We will all be applying the new way of integrating BEING and DOING into our unique area of focus for the 5 weeks. This journey of intimate coaching, support and strategy is all about YOU. 4 x Group Coaching Calls with Karen – one each week – where we dig deep into anything you want clarity on with intuitive coaching and guidance. Submit questions if you can't be there live. A Private Facebook Group with support from Karen. Each Mastermind gets their own FB group so it stays intimate. Printable Resources with all the processes, tools and techniques we cover over the 5 weeks. WHAT DO WE COVER IN THE WEEKLY OVERVIEW TRAININGS? Getting your connection to your intuition honed (no matter where you are at with it). The importance of Daily Rituals (create your own customised ritual that works for YOU). How to overcome overwhelm by putting the universe to work and harnessing your intuition. How to plan and strategise from an energetic place (﻿without﻿ pushing or 'shoulding'). Things you can do on the run to get you out of your funk and get you in your flow again. WHAT ABOUT THE LIVE COACHING SESSIONS? WHAT'S INVOLVED? This intimate 5 week journey is all about YOU – that's why we kick off with the 60 min Strategy Intensive to get clear on where YOU are and what YOU want to get out of our 5 weeks together. The weekly overview trainings will give you tools, techniques and processes, but the coaching is where the biggest value comes in. YOU get to ask whatever questions you like (if you can't make it live you can send me your Qs beforehand). YOU get clarity on anything you want. Anything. 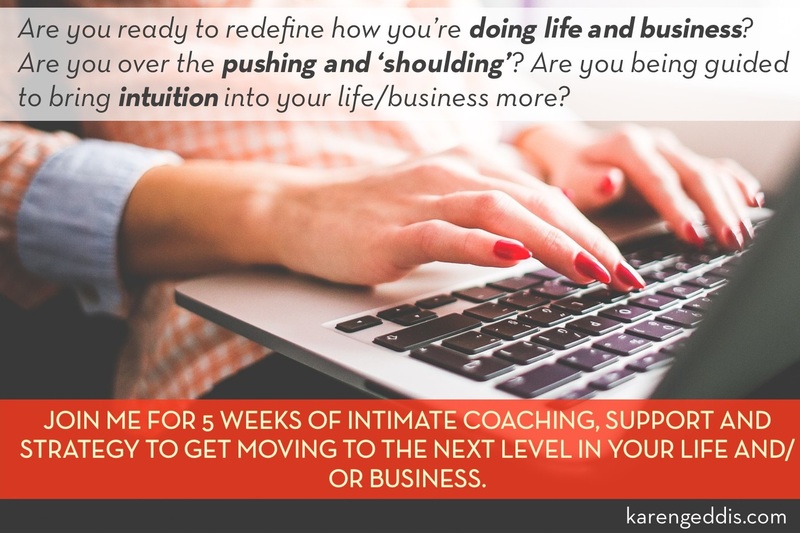 Karen instantly got where I was 'stuck', by tapping into her own intuition she was able to help guide me in breaking through limiting beliefs I had of myself, and in-turn help me move forward in my life and business with confidence. Karen is able to tune into your concerns and the heart of your business. She listens intently to you and then listens intently to the messages that come in. WANT TO TALK TO KAREN BEFORE JOINING?